When I visited the Bagel Stop Art Cafe a young Polish couple were hovering outside, unsure whether to go in. The snug, warm-looking interior, lined with startlingly original artwork, is certainly attractive but the bagel is an unknown quantity for the average Pole. “When Polish people come in they ask ‘Is it an obwarzanek?’” laughs welcoming host and chief bagel master Justyna Carruthers. “When they try it, they love it and come back for more.” Although the place has only been open three weeks, regular customers are building up – students living around the corner and the staff of a local real estate agency have quickly developed the habit of popping in for breakfast or lunch. “Our bagels are made fresh daily by a local baker who has a bagel-making machine shipped in from New York. Before we opened, he had nobody to supply them to,” says Justyna. She learned her love and respect for genuine bagels during a spell living in New York City. “I remember the taste of New York bagels very well, and ours are the closest you can get in Krakow – even American tourists who come in agree,” Justyna assures me. I can’t claim to be a bagel expert, but the toasted sample liberally filled with cream cheese and salmon I was presented with disappeared swiftly and enjoyably. Although it came from the expensive end of the menu, it cost just 9 złoty. A basic toasted bagel with cream cheese or peanut butter is only 4 złoty. Justyna is keen to create a relaxed and convivial atmosphere, and it’s clear she likes nothing more than chatting to her customers. Bagel Stop is a small place, but it has none of the rush-in, rush-out feel of a purely-business lunch stop. You are encouraged to sit, read, listen to the mellow tunes, or take your time examining the original canvases on the walls. 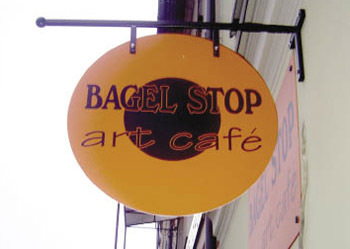 The ‘Art’ part of Bagel Stop Art Cafe is provided by Justyna’s husband Gerry Carruthers — a Dubliner who has been living in Krakow since 2008. Gerry’s paintings reminded me strongly of Australian aboriginal art, but the dense, strongly patterned picture space is woven with symbols from Venice or Japan or Ireland rather than Dreamtime animals. Gerry’s paintings, which are a hit at home in Ireland, are selling almost as quickly as the bagels. Plac Wolnica is an up-and-coming location, probably the last we will see this side of the Wisła. Justyna is not overly enthusiastic about plans to renovate the square, she likes it relaxed, but she hasn’t failed to notice the opportunity presented by the new footbridge just around the corner. Strolling through Plac Wolnica is something Cracovians are likely to find themselves doing more and more. My advice: get yourself ensconced as a regular at the Bagel Stop before the crowds arrive.